In late 1989 we bred CH Telltale Scruples to CH Autumfire Artesian, which produced Zieck (CH Telltale Eclipse). I showed Zieck to his championship, then turned him over to Robin to special. 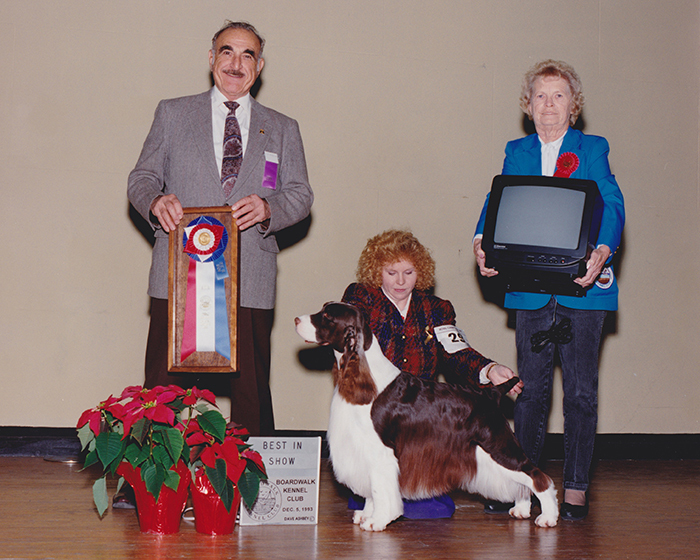 He was my first homebred Best in Show dog. This was the first of our males that Robin specialed for us and was her first BIS dog as a handler, earning a total of 3 BIS. He had many specialty wins, including BOB from the veteran class at Michigan. In 1994, he won BOB at the Garden. He was the ESSFTA Show Springer for 1993 and 1994, and runner up Show Sire of 1995. He was one of my heart dogs; he was funny, clumsy, silly and made me laugh. It was he who trained Michael (CH Telltale Wing Commander) to be my next heart dog.